In its final report (pdf over 100 pages) into the UK's financial asset managers, the FCA has raised a number of concerns about the way the industry is failing investors. Here are a few aspects from the report which may be of interest. 1 The asset management industry plays a vital role in the UK’s economy. Asset managers manage the savings and pensions of millions of people, making decisions for them that will affect their financial wellbeing. The UK’s asset management industry is the second largest in the world, managing around £6.9 trillion of assets. Over £1 trillion is managed for UK retail (individual) investors. 2 The services offered to investors involve searching for return, risk management and administration. The investor bears virtually all the investment risk. There are around 11 million savers with investment products such as stocks and shares ISAs. These investors are willing to put their money at risk to generate potentially greater returns than they can get through cash savings. 3 We find weak price competition in a number of areas of the asset management industry. We confirm our interim finding that there is considerable price clustering on the asset management charge for retail funds, and active charges have remained broadly stable over the last 10 years. We found high levels of profitability, with average profit margins of 36% for the firms we sampled. 4 We looked at fund performance, and the relationship between price and performance. Our evidence suggests that, on average, both actively managed and passively managed funds did not outperform their own benchmarks after fees. This finding applies for both retail and institutional investors. 5 We looked at whether some investors, when choosing between active funds may choose to invest in funds with higher charges in the expectation of achieving higher future returns. However, our additional analysis suggests that there is no clear relationship between charges and the gross performance of retail active funds in the UK. There is some evidence of a negative relationship between net returns and charges. This suggests that when choosing between active funds investors paying higher prices for funds, on average, achieve worse performance. Similar academic studies of the US mutual fund industry have typically found a negative relationship between fund charges and fund performance. 6 We find that it is difficult for investors to identify outperforming funds. 7 We estimate that there is around £109bn in ‘active’ funds that closely mirror the market which are significantly more expensive than passive funds. 8 There are a significant number of retail investors who are not aware they are paying charges for their asset management services. 9 Our analysis suggests that retail investors do not appear to benefit from economies of scale when pooling their money together through direct – to – consumer platforms. 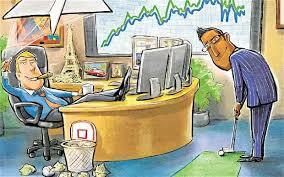 Having identified some of the problems, investors should not expect any significant changes anytime soon. 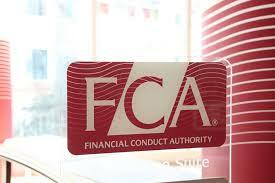 The FCA are now setting up working groups and further consultations and hope to report back some time later this year. They have to consider what impact any changes will have on the attractiveness of the UK as a place to continue ripping off small investors doing business. I will continue with my low cost index funds and investment trust and my low cost platforms. I would not rely too heavily on the ability of the FCA to give the best deal to the consumer but then I am a cynic! The best way to keep fund manager on their toes is via competition from the likes of Vanguard as more and more ordinary investors switch from the expensive underperforming actively managed funds into low cost index funds. The FCA can tinker around the edges but I believe the industry will always find ways around whatever changes are brought in. Leave a comment below if you have any views on this report. 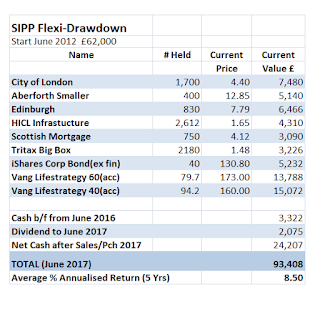 It's June, another 12 months has rolled by and time to review my SIPP drawdown portfolio at the end of its fifth anniversary. Here’s a link to the previous update of 2016. The original plan was to generate a rising natural income from which I would withdraw 4% which I calculated should be sustainable over the longer term without depleting the capital. This plan was revised following the introduction of pension freedoms in April 2015. The new strategy is to remove the value from my sipp up to my personal allowance each year - currently £11,500 - and surplus cash not required for income is transferred into my tax-free ISA. As a result of the revised strategy I have made a few changes. Last year I sold Dunedin Income, Murray Income Trust and New City High Yield and purchased Vanguard Lifestrategy 60 (acc) fund. Over the past 12 months I have sold Murray International Trust, Aberdeen Asian, Invesco Income Growth and Law Debenture. My Coventry BS PIBS were redeemed last June and half the proceeds (£14,000) were used to purchase Vanguard Lifestrategy 40 (acc). In addition I have recently sold one third of Aberforth Smaller Cos. Trust and also City of London. The smaller companies trust has had a good run and returns over the past 5 years are well over 100%. Finally there was a speculative purchase and subsequent sale of two shares - Unilever and IG Group, which has helped to boost returns. 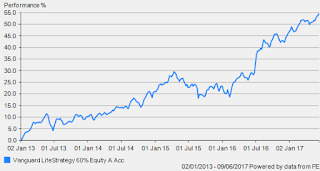 The other additions to my drawdown portfolio have been HICL Infrastructure, Tritax Big Box including a top-up following the recent rights issue, iShares Corp. Bond ETF and finally a holding in Scottish Mortgage Trust. 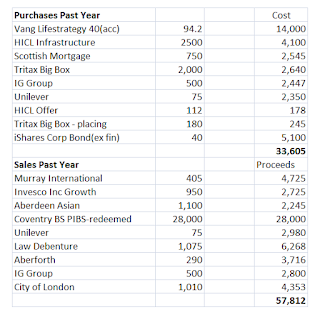 The value of the investment trust sales and Coventry PIBS redemption exceeds the value of purchases by £24,207. In addition there was a surplus from the previous year, also there are accumulated dividends over the past 12 months. As a result I am still holding quite a large percentage of cash for the time being and will await a recovery in sterling and a pull back in the markets before looking at reinvesting the cash. In any event, I plan to hold a cash buffer of around £4,000 or 10% of Lifestrategy value which I can draw down for 'income' during bear market periods. I would not feel comfortable selling down units in my LS funds for income when their value was less than the previous year. My report last year was just before the Brexit referendum and returns had been checked by the doom and gloom merchants warning of the dire consequences of Britain leaving. Of course, we did vote to leave but after a brief dip, the markets soon recovered and have surged ahead to reach new all-time highs over recent weeks. I expect some volatility until the outcome of exit negotiations becomes clearer. Article 50 was eventually triggered in March followed by a snap general election earlier this month which was supposed to strengthen the position of the prime minister but it did not quite go according to plan and the Tories ended up losing seats and now hoping for a deal with the the DUP to cling on to power. This has weakened the governments negotiating position and there is a strong possibility of yet another change of leader and also yet another general election. Hardly the ideal backdrop to the start of Brexit negotiations with the EU over the coming couple of years. I am thinking the markets will take a dive if the talks end in deadlock but I think it will be in everyone's interest to reach a sensible agreement. So far the markets appear to brush aside the political uncertainty. Over the 12 months, the FTSE 100 has risen 25% from ~6,000 to currently 7,524. My SIPP portfolio is now more defensively structured with a larger proportion of bonds and cash, however it is pleasing to see a gain of 16% over the year. The starting value in June 2012 was £62,000 and taking account of monies withdrawn, the portfolio is above £90,000 for the first time. 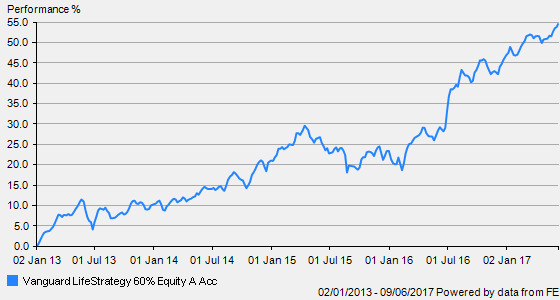 My holding in smaller companies specialist Aberforth has, once again put in a very strong performance and return of 35% over the past year - the average return remains high at over 20% p.a. 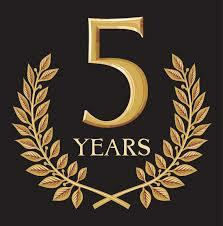 over the past five years. At the start my smaller companies trust comprised just 6% of the portfolio but had increased to over 10% so I have trimmed the holding by selling 290 shares. City of London has also had a solid year with a return of ~20% and I have top-sliced with a sale of 1,010 shares. The total return including income after 5 years is 50.6% (last year 43.1%) which is very satisfactory and works out at an average annualised return of 8.5% p.a. 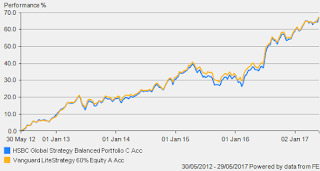 In June 2012, the Vanguard LS 60 (acc) price was £105 and today stands at £173 - a gain of 64.7% or annualised average of 10.5% p.a. The overall annualised return of the SIPP portfolio after 5 years is 8.5% p.a. Under the new pension freedoms which took effect from April 2015, I am no longer restricted by the GAD rules and I am now able to drawdown as much or as little as required. As my pension is my main source of taxable income, it makes sense to reduce the pot by transferring the capital tax free to my ISA. Over the past couple of years I have taken out £21,000 and I intend to withdraw a further £11,000 for the current tax year. A big percentage of income in previous years came from my Coventry BS PIBS however these were redeemed last June and this will reduce the natural income by £1,700. Furthermore there is now less revenue from the income trusts which have been sold and replaced by my Lifestrategy funds - both accumulation versions. I have relied upon my SIPP to supplement my ISA income and bridge the gap between early retirement and state pension. This part of the journey will become 'mission accomplished' next year. In 2018 my state pension will commence and I will be less reliant on the income from my SIPP for essential living costs and it will become more for discretionary spending. My recent forecast suggests I should receive a sate pension of ~£8,500 and as this is taxable, it will limit the tax free sums I can take from my SIPP to around £3,000. Any money withdrawn above this amount will be taxed at 20%. I retired from paid employment at the age of 55 yrs and obviously at the start of the process there is some uncertainty on the big question of what is a sustainable level of income to draw down. My starting point was ~4.0% and so far this has been well within the level of growth generated by the portfolio over 5 years which gives me more confidence that this level of drawdown can continue longer term. The next question is whether, over the remaining period, I could increase the withdrawal to maybe 5%. Having been a saver all of my adult life and living well within my means, I find it quite a challenge to become a 'spender' now the funds are available! 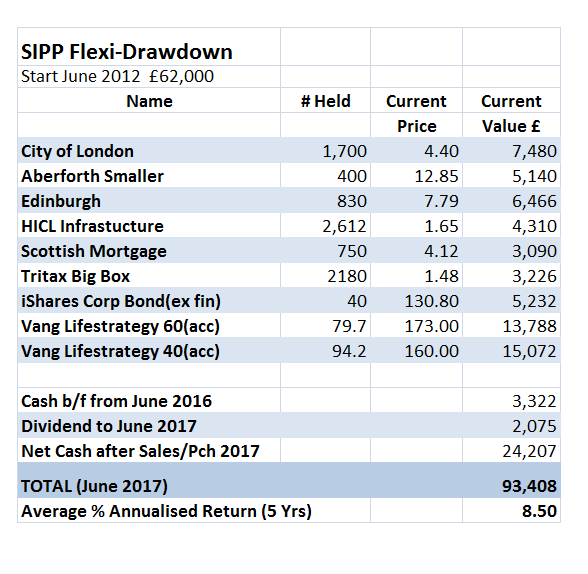 I am reasonably happy with my first five years of self-managing a flexi-drawdown sipp portfolio. For the first 3 years, the dividend income has predictably rolled in much as planned and importantly, increased each year a little ahead of inflation. Now I am able to withdraw significant lump sums tax free and place the excess which I do not require for income in my ISA. Of course, there are no tax liabilities for all monies subsequently withdrawn from my ISA. If you are managing your SIPP or you are planning to do this, feel free to share your experience in the comments below. Looking back to early 2013 when I started this blog, it is clear there has been quite a significant change to my investing strategy. Back then I was focused on a portfolio of individual higher yielding UK shares combined with a ‘basket’ of investment trusts to generate the natural income I required in retirement. Now I hold an equal mix of trusts and Vanguard index funds. When I compared the performance between the basket of trusts and my index funds last year over a 5 yr period, the trusts came out as clear winners. One year on and I will have a look at the same 5 yr comparison having regard to the portfolio changes I have made in the past year. In the past 12 months I have disposed of Murray Income, Invesco Income, Aberdeen Asian Income, Murray International, Law Debenture and Dunedin Income. I realised at some point that I was limiting my investing options by restricting my chosen investments to those that provided an adequate natural yield - say 3% minimum. This had ruled out looking at the likes of Vanguard LifeStrategy funds with a natural yield of under 1.5% for example. I think also I was holding too many UK-focused income trusts. My managed investment trusts have provided mixed returns in recent years. The ones which have delivered for me are Nick Train’s Finsbury Growth & Income, smaller company specialist Aberforth, Edinburgh & City of London and these have obviously been retained. I have added a few additional trusts to provide more diversity - HICL Infrastructure, TR Property and Capital Gearing and these have been included in the updated comparison. Of course it is impossible to know in advance which investments will do well - all I have to go on at the time of purchase is past performance which is not necessarily a very good indicator. Over time, it becomes a little clearer which trusts are performing better than others. I find investment trusts less volatile than individual shares however, they do use varying amounts of gearing and can trade at a premium or discount to their NAV so they are a little more complex. Against this is the advantage for the investor who requires income of their ability to pay a steadily rising dividend steam due to their being able to hold back excess income in reserves during good years. The fortune of the trusts are always dependent on the managers making consistently good calls - some appear to be reasonably competent and some a little more average. Here is my basket of 9 investment trusts showing returns over the past 5 yrs to mid June 2017. I am pleased to see the basket of managed investment trusts are still doing the business and have delivered an additional 3.7% return compared to my Vanguard funds. The basket used for the comparison last year would provide a reduced average return of ~12.5%. I think it is clear that some managed trusts can add value to a portfolio and it is therefore worth paying the extra charges but of course it is difficult to identify in advance which of the 400+ on offer will continue to outperform. Some of the trusts I selected when I started my investment trust income portfolio have fallen short of my low cost index funds - for example Aberdeen Asian Income, New City High Yield, Murray Income and Dunedin Income. Maybe luck plays a big part in the investing process! Having replaced a few trusts in the past 12 months, I am happy to continue with my combined managed and passive 50:50 mix for the time being. The pendulum seems to be swinging towards low cost passives in the debate as to which is the better option for small investors but from my experience so far, it does not need to be one or the other but can be both. Leave a comment below if you have any thoughts on active v passive. 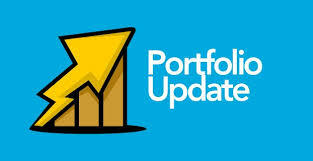 There have been a few changes to the portfolio since my last update at the end of 2016 so as it is fairly quiet on the results front, I will take this opportunity to bring things up to date. This started off in 2013 as my investment trust income portfolio. Over the past year or so, it has morphed into a collectives portfolio as its scope broadens to include my low cost index funds. 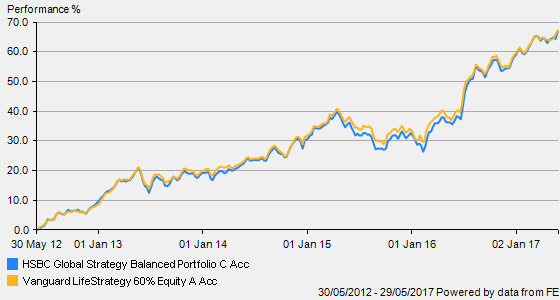 Also last year, as I have been selling down my individual shares portfolio, I decided to merge the two portfolios. Although this is demonstration portfolio, it largely mirrors my own holdings. As the markets have been hitting new highs in recent weeks, I have taken the opportunity to sell down a few more individual shares including IMI, Berkeley and Amec Foster. The net proceeds were £5,110. There are now just two shares remaining - 30 Next and 800 Legal & General. In addition I have recently disposed of Law Debenture trust and top-sliced my smaller companies specialist Aberforth - sale of 140 shares and also Edinburgh - 365 shares sold which brings it closer in weighting to City of London and Finsbury. The proceeds have been recycled into new additions HICL Infrastructure, iShares Corp. Bond and most recently Capital Gearing Trust. My demonstration portfolio has now been running for 4.5 years. 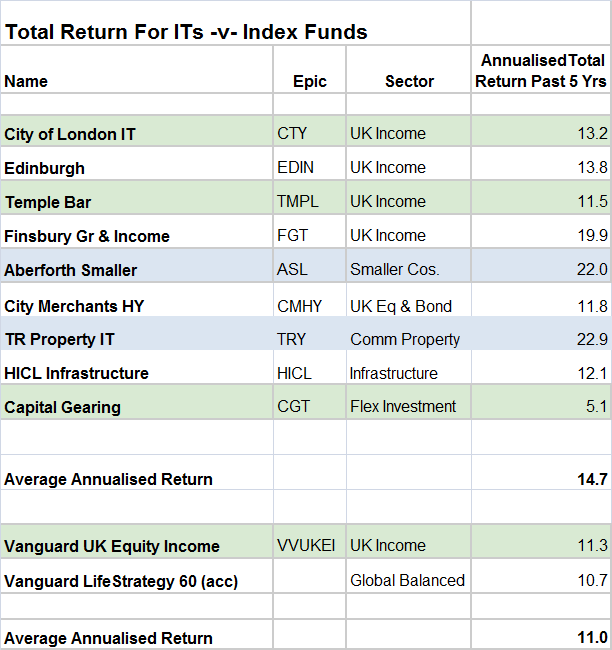 Many of the investment trusts have been there from the start - City of London, Aberforth, Edinburgh etc. The main development over the past 18m or so has been the introduction of the passive Vanguard funds and the decision to abandon the individual higher yield shares, although a couple still remain. The portfolio has been on the rise over the first few months of 2017. 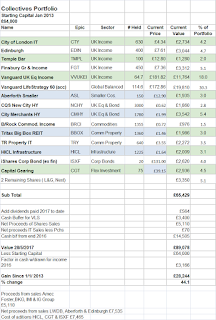 So, how have the various investments fared and are my investment trusts adding additional value compared against my Vanguard trackers? The only investment to have lost ground in 2017 is Blackrock Commodities however it is the smallest holding by value and also, as it gained 69% last year, I am not too troubled. Leading the pack is smaller companies specialist Aberforth with 24% and new additions TR Property 19%. Most of the others have reached double figures which is good. There has therefore been a little more progress since 1st January. 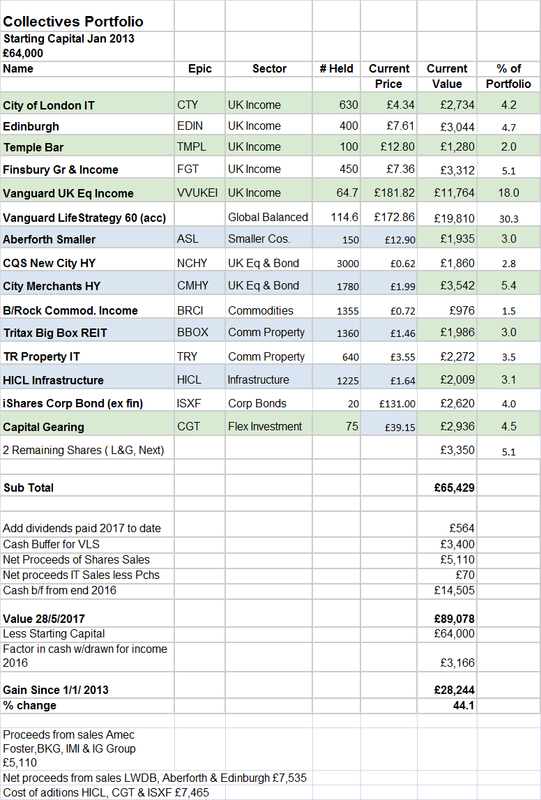 The value of the combined portfolios at the start of 2017 was £85,398 compared to the current value of £92,244 - a rise of £6,846 and total return of 8.0% year to date. The total return for the FTSE All Share index is 8.2%. There is currently a large percentage of cash sitting on the sidelines. Some is from recent shares sales and some from a top slice of my Lifestrategy fund last October. One of the reasons for turning to the addition of Capital Gearing was my concern about the high valuation of equities. 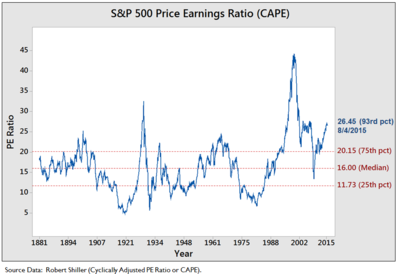 The US markets have seen the second longest 'bull' run since 1945 and the CAPE ratio is approaching 30 compared to the long term average of 16.8. In addition, the slump in sterling post Brexit - currently $1.27 - makes global investments relatively expensive so I will stay in cash for a little while longer. The average annualised return for this demonstration portfolio after 4.5 years is ~9.0% - so far, so good...well sort of...because the average return from my VLS 60 fund over the same period is over 10% p.a. - how simple would it have been to invest the £64,000 in that from the very start? The price of the fund in January 2013 was £111.71 and the portfolio would now be valued at £99,000! I will return to this in December for my annual end of year review. 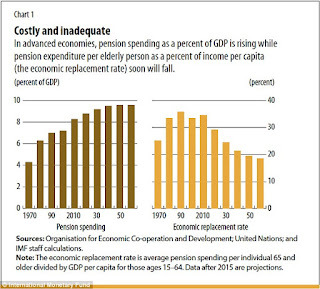 I recently read a report (pdf)by the World Economic Forum which was looking at the implications for sustainable pensions resulting from increased longevity. Since the 1950s life expectancy has been increasing at a rapid pace as a result of improved living conditions and advances in healthcare provisions. Half of all children born in 2017 are expected to live to 103 - that's 2120! This has massive implications for many aspects of our society, not least on welfare and retirement pensions. It is calculated that whereas today there are 8 workers supporting each pensioner, by 2050 there will be just 4 workers for every pensioner. 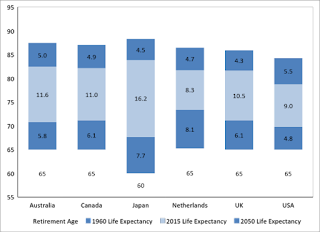 The chart below illustrates the retirement ages for the six countries with the largest pension systems. Retirement age for most of these countries is 65 (with Japan the exception, at age 60). The bottom bar represents the number of years of payments expected using life expectancy in 1960. This ranged from five to eight years of payments on average. Looking at life expectancy in 2015, we can see that pensioners are now living eight to 11 years longer – and in the case of Japan, a whopping 16 years longer. The WEF have used OECD figures of 70% of pre-retirement income as a rough guide to assess the gap between current pension/savings provision. They have calculated the shortfall in savings to 2050 to see how much the gap will widen if measures are not taken to address the problems. The calculations assume that retirement income will come from a combination of state pension, private/works pension and individual savings. In the UK the current savings gap is calculated at £6 trillion and is expected to grow at an average of 4% per year to reach £25 trillion by 2050. In the US, the savings shortfall is expected to grow by $3 tr each year, equivalent to 5x their annual defence budget. The largest growth will come from China and India who have the largest populations - there will be 600 million retirees in these two countries by 2050! 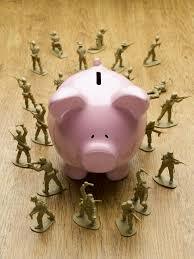 The WEF have made a number of suggestions to help secure greater financial security. 1 Make it easier for people to access well managed cost effective pension plans. 2 Support initiatives to increase levels of retirement savings rates. 3 Explore the concept of linking savings to spending - for example, a percentage of an individuals every purchase is electronically linked to that individuals savings account. 4 Look at collective DC pension schemes which pool retirement savings to reduce fees and spread risk (currently used in Canada and Holland). 5 Educate individuals regarding savings and probability of achieving a satisfactory retirement income based on current level of savings. People who start saving at the start of their career end up with double the savings compared to those who delay by 10 years. The message is clear - we are all living longer than ever before and our state pension system will need to change as otherwise they will become unaffordable for tomorrows taxpayers. As a result, younger people entering the workplace today will need to take more responsibility for their retirement income. The WEF believes workers need to save between 10pc and 15pc of their annual salary to support a reasonable level of income in retirement. In recent years the government has grasped the nettle and the state pension age will increase to 66 from 2020 and will be reviewed every 5 years. It could well rise to age 70+ by 2050. Currently, half of all workers have made no private pension provisions. 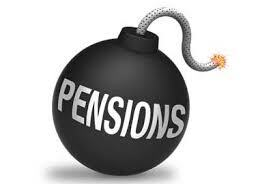 The introduction of auto enrolment will start to improve things but the current rate will be just 8% including employers contribution. Its a start but needs to go further. When I started out in the world of work in the early 1970s, I was fairly confident the state pension would provide a significant proportion of my retirement income at age 65 yrs. Some 45 years later and yes, I will start to receive my pension at 65 and I am told the starting amount will be £8,500 which is roughly the ballpark figure I always expected. If I were starting out today, I am sure I would not be so optimistic. As I suggested in a recent article on national debt levels - young people need to give some serious thought to retirement savings. 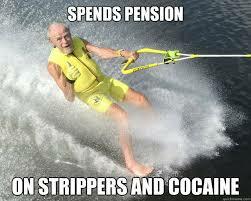 Leave a comment below if you have any thoughts on the state pension. In my recent post reporting on my holding of Vanguard Lifestrategy 60 fund, I concluded that I was happy with performance to date but would prefer less exposure to the UK market. 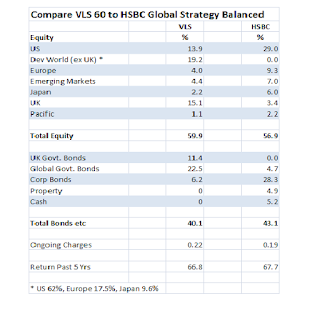 One of the comments suggested a look at HSBC's Global Strategy funds as an alternative. The closest match to my LifeStrategy 60 is their Balanced fund so I will briefly compare the two. The main difference is that the HSBC fund is actively managed and whilst some of the underlying funds are passive, the allocation of assets is reviewed on a monthly basis and the manager will make adjustments to the mix within pre-determined limits. The fund therefore relies upon the ability and judgment of the manager to make consistently good calls. The Vanguard fund however maintains a much more rigid structure to keep the equity allocation very close to 60% at all times. However, they deliberately maintain an overweight allocation to UK equities - 25% which translates to 15% of the whole fund. In other respects, the two funds are very similar - both offer a blend of assorted global equities and bonds using predominantly low cost index funds or ETFs. With the VLS fund, these are all from Vanguard's own range of underlying funds. With HSBC, they use a mix of their own funds combined with ETFs from iShares. 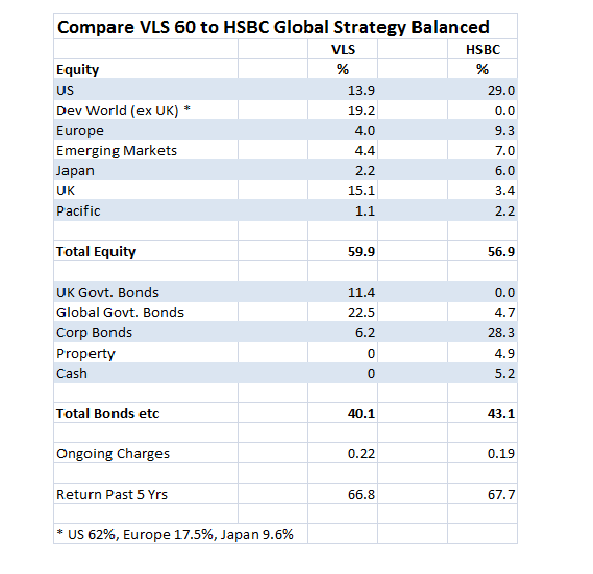 There is however some variation in the composition of the two funds - VLS provides a higher proportion of government bonds as well as the much higher weighting to UK equities. The HSBC fund offers a higher weighting to corporate bonds, adds property to the mix (5%) and a much lower weighting to UK equities - just 3.4% compared to 15% for the Vanguard fund. This could,of course, change should the manager consider UK equities to be under-valued at any future point. Although both funds were launched in 2011, the Vanguard fund is much more popular with assets of £2.3bn compared to just £94m for the HSBC fund and I was surprised to see the charges for both are close - VLS at 0.22% and HSBC at 0.19%. Performance over the past 5 years is remarkably similar - a return of 66.8% for Vanguard compared to 67.7% for the HSBC fund. The income yield is slightly higher from the HSBC fund at 1.4% compared to 1.3% from Vanguard and assume the extra income will be mainly generated by the higher proportion of corporate bonds. I had not previously come across the HSBC funds before but this is not really surprising given the many hundreds of funds on offer to the small investor. Having had an opportunity to research them, I must say they do tick a couple of boxes for me. I like the lower weighting to UK equities and I like the option of property. On the negative, I am not so keen on such a large proportion of corporate bonds - just under 30% and would prefer the greater stability offered by the proportion of government bonds offered by the VLS fund. The Vanguard Lifestrategy is by far my single largest portfolio holding and I would not really like it to make up more than say 1/3rd of the total so this could be a possible alternative at some point. What do others think? Would this be a good second string to the low cost global index bow? Leave a comment below.